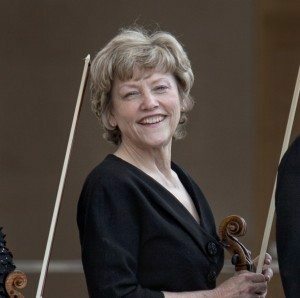 Sally Chisholm is violist of the Pro Arte Quartet, Professor of Viola, and artist in residence at UW-Madison. She is a permanent member of Midsummer’s Music Festival (Door County), the Northern Lights Chamber Music Institute (Minnesota), and the Chamber Music Society of Minnesota. During the 2013-14 season, Chisholm served as Principal Violist of the Chicago Philharmonic. She performs annually in the Festival Der Zukunft in Switzerland and the Marlboro Festival in Vermont, and in 2013 she performed at the International Viola Congress (Krakow, Poland). Chisholm was a founding member of the Thouvenel String Quartet, which co-commissioned quartets of Elliot Carter, Milton Babbitt, Mel Powell, and Ernst Krenek. Chisholm’s concerti performances include the revised version of Bartók’s Viola Concerto (Budapest), the premiere of Schoenfield’s Viola Concerto (revised version), and an upcoming recording of Hindemith’s Trauermusik. Her recitals of twentieth- century American viola music are legendary, and her premieres include Edmond Cone’s Variations for Solo Viola, John Harbison’s The Violist’s Notebooks, Andrew Imbrie’s Sonatina, the American premiere of Yehuda Yannay’s Viola Sonata, and new chamber works for the Hun Qiao Concert with Yo-Yo Ma. Chisholm won first prize at the Weiner International Chamber Music Competition and was a Naumburg Competition finalist. She has performed on the Today Show and has toured in China and Tibet. She is a board member of the American Viola Society and has been juror for the Wronski Solo Violin Competition. Former students include Elias Goldstein and Vicki Powell, who are laureates of the 2011 Primrose International Viola Competition, and Joanna Mendoza of the Arianna Quartet. In spring 2016, Prof. Chisholm was named a WARF professor, an award that carries a $75,000 research prize, and a title of Germain Prévost Professor of Music. Ms. Chisholm is a board member of the American Viola Society. Tamar Diesendruck Quartets, Centaur Records. Tamar Diesendruck Theatre of the Ear, Centaur Records. Mendelssohn Quartets, Op. 13, Op. 44/1, Op. 81/4. Dvorak Quartets, Op. 34, Op. 51. Rhodes, Sessions, Mays, with Samuel Rhodes, Viola, Albany Records. Pro Arte Centennial Anniversary Commissions, Mays, Schoenfield, Bolcom, Harbison, Albany Records. In progress, Pro Arte Centennial Anniversary Commissions, Mermier, Jalbert, Charles Neidich, Clarinet, May 2015.